Feeling the blank and blink of it all after my father passed away in October. The blank is that empty feeling and not knowing where to go or what to do next. The blank is the ungrounded feeling. It might even be a feeling of disconnection, unsurety, insecurity, lack of confidence, or the ground shifting underneath you. It’s a feeling of loss of control. It could be wanting to get time or him back, but he and it are already gone. It’s so sad. The blank is staring at this computer screen wondering where my mind is going to go and what to write, as I seldom edit anything… I just write. The world lost an incredible man on Oct 19, 2018. James F. Hamilton, IV, Our dad, my mom’s husband and lifetime love of 43 years, father of ten and grandfather of 18, passed away after quite a battle since 2004 and especially this past year. I’ve written countless blogs and even a book about my parents, which included his stroke survival story. I’ve been trying to figure out where to restart, what to write about, how to help my mom, how to help my family, how to help even myself and my own family. Everything has changed. I haven’t written a thing in months… Well, I’ve written here and there, but so just not into it at all. It’s just not even knowing what to say really. I feel so awful for all of us who have lost a parent or more. I can see the daily prayers and feelings of grief posted so very often in Facebook. There are endless calls and cries for love, help, assistance, attention, community, consoling and more. I get it. I’ve posted my own posts quite often. Thank you for your love. So many of us experience these moments where life turns upside down and we don’t know what to do next. There isn’t really a new normal. It’s changed. Some are forever changed and get lost in forever grief. Others plod along. Others charge full steam ahead and bury feelings to deal with on another day, hoping the days keep coming but the grief stays at bay. The blank is all over the place and reactions and actions vary. Words may or may not be comforting. Time is still ticking. Life is still happening. It’s hard to get clear on how all of our lives proceed. There is so much that was that now isn’t. There is an emptiness for us all – especially for my mom. I boarded a plane on Oct 16 from Boston to Minnesota. My mom and brother Justin picked me up at the airport. From there we went to the hospital to see my dad. Later that day, I met my sister’s new baby for the first time. My sister had her baby a few months ago in the same hospital my dad was in and they were on different floors. I still can’t find the words from how truly difficult those moments must have been. Moments mixed with sheer joy and incomprehensible sadness and situational distress. My sister and her husband and children are strong. I wanted to write about it then, but decided to just keep quiet. Our dad has had an up and down rallying battle this past year, which he spent mostly on and off in ICU since April. Even in the few weeks before he passed, he had an incredible rally. He passed on October 19, 2018 at 5 p.m. The next day I found myself writing again – only I was writing his obituary with my mom. Quite frankly, I probably need a new computer as the keys on this now stick a bit from crying over them. I’m certain my mom, brothers and sisters pretty much didn’t love any of those moments either as proofreading, contributing and changing our dad’s obituary was both gut and heart wrenching. So that’s the blank of it all. The blink of it all is our reminder once again about time. Remember, and I know I always say this, Your Moments Matter. If it matters to you, do it. If it matters to someone else and you are can support them – help. You will not ever get your time back. Don’t drown gratitude in grief, anger, sorrow or sorrowful moments. The blank and blink go together. Remember that. Surround yourself with people who comprehend and practice the blink and blank of it all. We all take turns and trade these moments whether we like it or not. Together is the only way to get through the moments ahead. These are the moments where the universe of uncertainty and change have firmly planted themselves in your life. You are never alone and when life changes in a way you couldn’t have ever pictured or desired, it can be critical to know you may not have every answer, solution or plan, but be reminded you are never alone. Whether it is your family/community online or your family/community in person, you are not alone. It is important in the times of blank and blink to further root in gratitude and love and adjust with mindfulness and community. I don’t know what else to say right now. 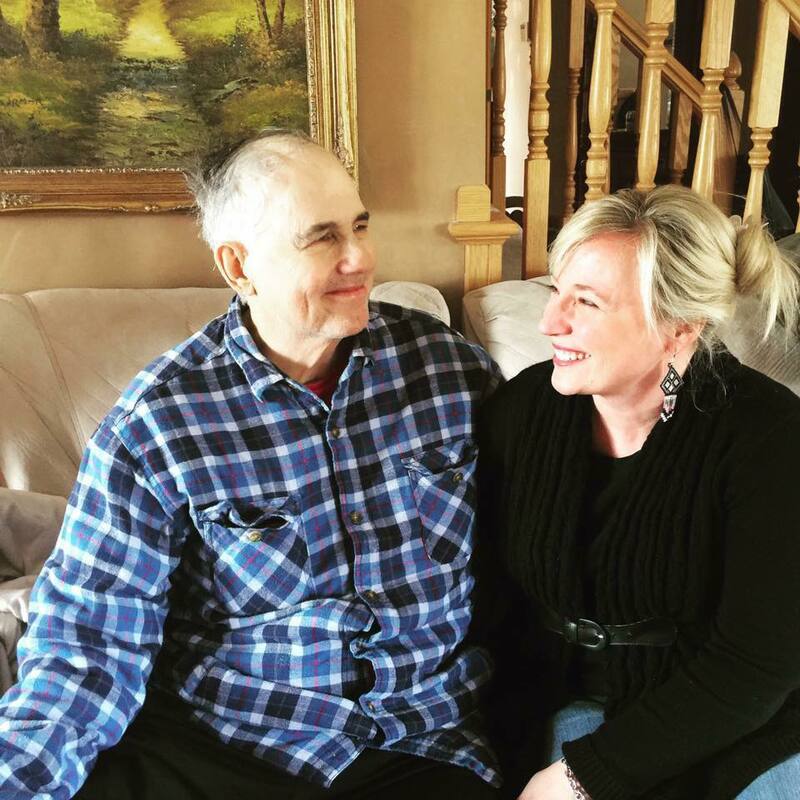 Wait, I do, actually: I want to tell you how much I loved my dad. He was just one of a kind. I will miss you always dad. He was a very very cool person. He lives on within us all and touched so many lives in positive ways. Elizabeth Hamilton-Guarino, founder and CEO of The Best Ever You Network and author of the best-selling book PERCOLATE, understands firsthand the challenges that life can bring and has worked with thousands of people worldwide to illuminate their light within and help them live their best life. She has a degree in communications and broadcasting; is a life coach, food-allergy expert, and anaphylaxis survivor; and is the host of The Best Ever You Show. Elizabeth and her husband and four sons live in Maine.